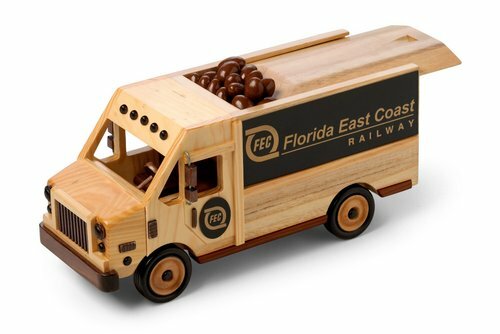 Our contemporary Delivery Van is one Each wooden collectible is hand-made, so no two are identical. One of the most popular vehicles on the road today ? or special message! Loaded with gourmet treats, this is one special delivery that will long adorn the desk or book shelf of any lucky recipient ? for years to come! Price includes (1) laser engraved plate on side of van. Imprint area: 6in W x 1-3/4in H - side plate; 1-3/8in H x 1-1/8in W - door medallion. Additional laser engraved plate on side of van add $4.00. Additional laser engraved door medallion add $2.00 each. Price includes an individual mailing box. Delivery Van dimensions: 12in L x 5in W x 5-3/4in H.
Individual Shipping Weight: 5 lbs. (4 lbs. Empty). Imported Item. 4 individual boxes to Master Carton, please inquire for shipping weight.